Welcome to Blue Raysâ one of the finest Chinese restaurants in Kent. 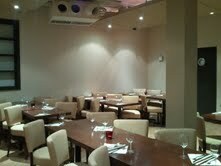 Authentic Indian Cuisine offered in a contemporary location. Our specialities include Nizami Kofta ,simply superb,or the moorish garlic naan. The Surin restaurant is only a two minute walk from Ramsgate harbour yet specialises in three exotic Asian cuisines: Thai, Cambodian & Lao.